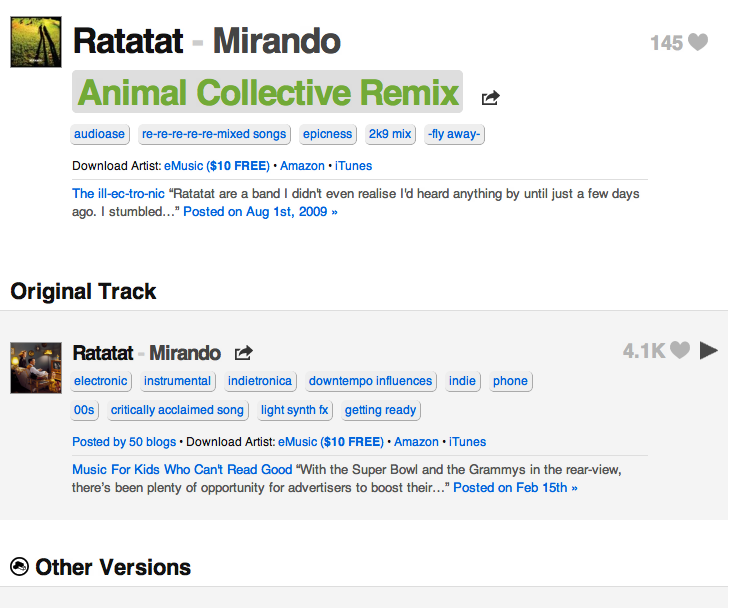 Here’s something exciting we launched last night: remix tracking! We’re spotlighting remixes with the Creative Commons remix icon (those are little building blocks, if you were curious). We also know that some people LOVE remixes, and some people HATE remixes. 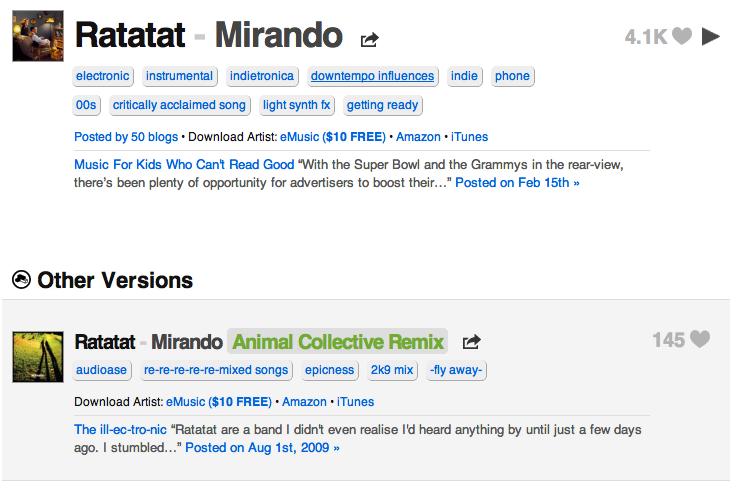 So now, you can listen to all-remix or no-remix versions of our Latest and Popular pages. Try it out and let us know what you think! I can’t click on the title of the song since this new feature. By the way most of the usual links don’t work (using Chrome or Firefox). Is it normal ? Great plus! I like being able to find quickly the original song of a remix. What about a “Remixes” tab next to the other stream tabs where one would find remixes of songs he’s already favorited? I mean, you said some people “HATE” remixes, it seems to me the reason for this is that remixers can get so far from the original that it becomes a completely different song in a very different style/genre sometimes. Therefore there are few chances you stumble upon a remix when the blogs you follow focus on other styles/genres than that of the remix. But still, some people are curious. They may no want to hear remixes they’re likely not to like, but do want to know there’s a remix to a song they favourited without having to scroll through the dozens in their favourites (the only way to find them since, like I said earlier, there are few chances the blogs thanked to which you found your favourites post them) just to be aware of it.